The Charyn Canyon. The Valley of Castles. Description of beautiful place for tours and excursions in Kazakhstan. The Charyn Canyon. The Valley of Castles. 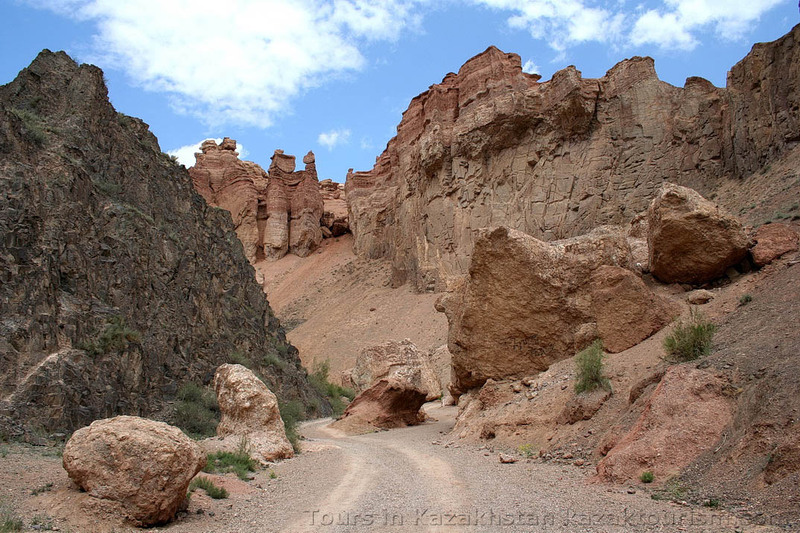 One day tour: Charyn canyon, Berkutchi museum. Two days tour: Charyn canyon. Assy plateau. Turgen gorge. 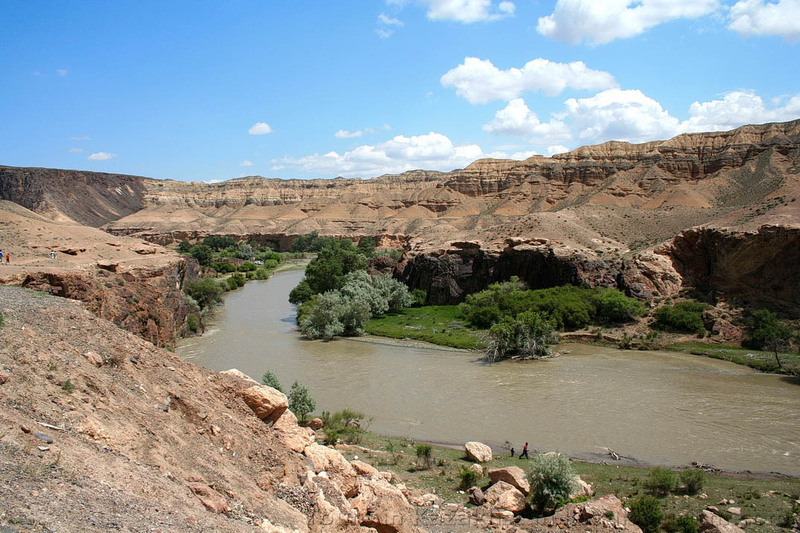 The Charyn river is one of the Ili river tributaries. It flows down the passes of the eastern spurs of the Zailiyskiy Alatau. Its rapid stream stretches for more than 350 kilometers. 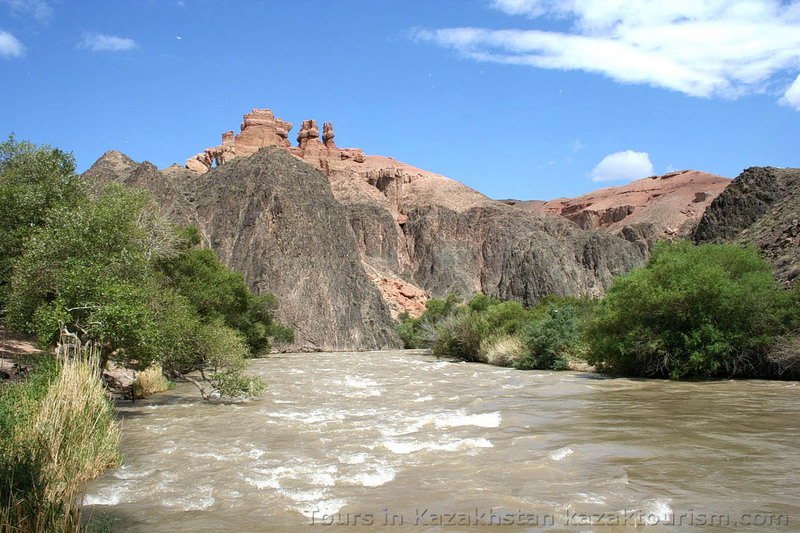 The river has got different names: in the middle flow it is called Kegen, and after the junction with the other stream called Karkara the river becomes the name Charyn. During many thousands of years this powerful river has created the most gorgeous canyon along its course. But the most popular and the most visited in the last years part of the canyon became the Valley of Castles – the name that had been chosen quite exactly because the unusually shaped formations resemble the fortress walls. 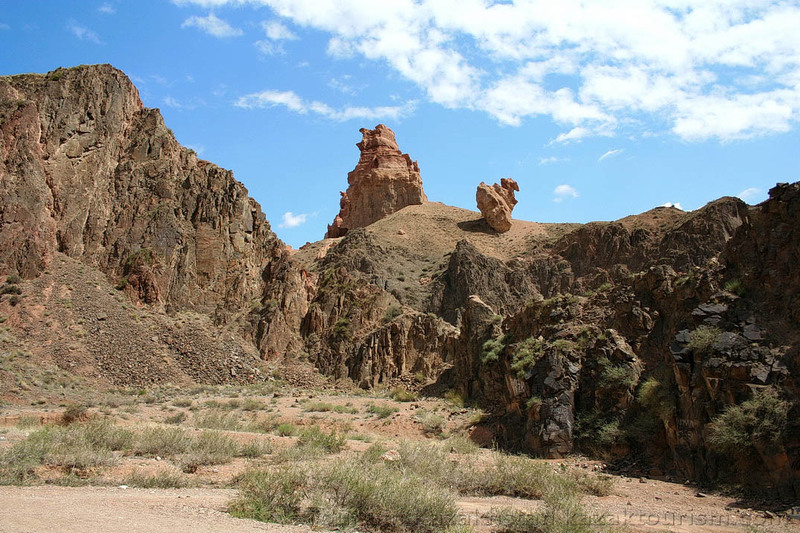 This is the fanciest nature creature you can visit during one day taking a tour from Almaty and this place will keep you bewitched for a long time.The Valley of Castle is a wide dry three kilometers long canyon joining the main stream of the river. The river has its other way now but millions of years ago this place was a gulf of a giant ancient sea. The sea was stretching from the Alakol lake to the Caspian sea. This fact explains the soft structure of the canyon walls consisting of stones pressed together by clays. But these rocks change their form easily under the impact of water and wind. The nature as the greatest sculpturer creates some fancy giant sculptures or pretty little figures.The way to the Valley of Castles is pretty exciting. You shall cover a 200 kilometers distance from Almaty to the Valley of Castles going past Zailiyskiy Alatau mountain range so that you can see the highest ever white mountain tops. You will go past some smaller and larger villages and every of them is special in its own way. It is better to plan your tour for spring or autumn because the life of the canyon stops in July and in August – the heat is really bad in this time period. Along the road you may see all the products that are cultivated in this fruitful region of seven rivers. The mountains slowly become low-sloped, some wide valleys come in view and the blue ribbon of Ili river appears sometimes far away in the north.You reach the last big village on your way- Baiseit village where is the picturesque road-side bazaar with a great choice of products. The bus stops there for the tourists could buy some freshly baked flatbread, vegetables or fruit and to limber up after a long sitting. Finally the civilization stays behind and the bus increases speed on the way straight as an arrow. Then the way turns to the Kokpek canyon and meander between steep rocky mountains that are quite picturesque in spring covered with brightly coloured poppy flowers and wild irises. At the Kokpek pass there are some little houses and a road café. From this point starts the last part of the journey that is some kilometers long. The boundless Sagety valley spreads out at the both sides of the road framed by the faraway mountains. If you look from far away it seems that there are some coppices at the skyline. In fact these are some kind of illusions, because when you get near to them you can clearly see that these are actually the mountains.From the far distance the canyon looks like a valley and only when you get nearer to the edge you see a deep lying valley that is not very wide and has got fancy rocky walls. There are some pathways to the Valley of Castles now. But earlier there were none and the tourists took the extreme way to get to the valley: using cords they climbed down from the top of the edge to the bottom. The appropriate pathways were found later. You walk down the steep path at the beginning of the canyon, then you walk along the way going further to the valley. The views are fascinating and worth being photographed, so normally tourists admire this moment and express many positive emotions. That is understandable because the steep canyon walls are shaped in a fantastic way. Everyone may see in these fancy shapes something different: one can see a huge frog talking to a lizard; another one could see a giant tortoise several meters tall carrying a load or a jumbo with a peaky nose…Generally the canyon walls are 100 meters high. Some parts of the canyon resemble the protecting walls of the castles of the Middle Ages. Then you pass the real gates created by two huge rocks that used to block the passage of the vehicles. There are some fantastic views worth being photographed. Going a bit further you will hear an obtuse roar of Charyn river and feel the breezy breathing of its flowing water.Here you will see the really dark rocks marked by some splits and caves; the rocks with some carved by the tracks of the spring water streams. At the entrance to the round valley of the river there is a funny sculpture created by the nature that looks like a huge animal with a long nose standing on a thin leg. It seems to be sadly waiting to fall down. But on your way back some other images will capture your imagination and everything will look in a different way. The violent and stormy Charyn river meets its guests by its warning roaring saying "I am really very dangerous, so do not get too close to me”. You can hear the stream carrying huge rocks. Indeed, if one falls into the stream, there is no chance to be rescued, so you have to be careful and listen to your guide. There are some interesting trees growing on the bank of the river – Asiatic poplars. Their leaves are not the same on the same tree, they have got different shapes. On the opposite bank of the river there are the red rocks resembling the Chinese pagoda. A break is usually done on the river bank for having a snack and some rest before the way back.It is also possible to get up along a narrow rocky path on the right bank of the river, but only in a small group with a guide and very carefully. Another way is much more interesting (and safer), when you get up the path starting near the rocky gateway. This path is seen slightly indefinite on the slope, it goes parallelly to the road first and then goes up gradually. There are burrows of the curious gerbils, small mammals also known as "desert rats”. They stand as little columns near their burrows where they will hide quickly when something (or someone) dangerous appears. Gerbils live even along the rocky way at the bottom of the canyon, building their settlements and burrows directly on the road.On your way back it is highly recommended to turn around many times to enjoy the changing and breathtaking views of the Valley of Castles lying at your feet.The best days for visiting the canyon are the weekdays. During these days the silence is fabulous. You may meet some rare falcons that used to build their nests there until it became too noisy. Some quick lizards cross your way fearlessly. In spring it is possible to meet a hare jumping out of the grass. The nature takes a rest after the noisy and tiresome weekend and the peaceful silence helps your soul to relax. Please use the links below for more detailed Charyn canyon tour description. 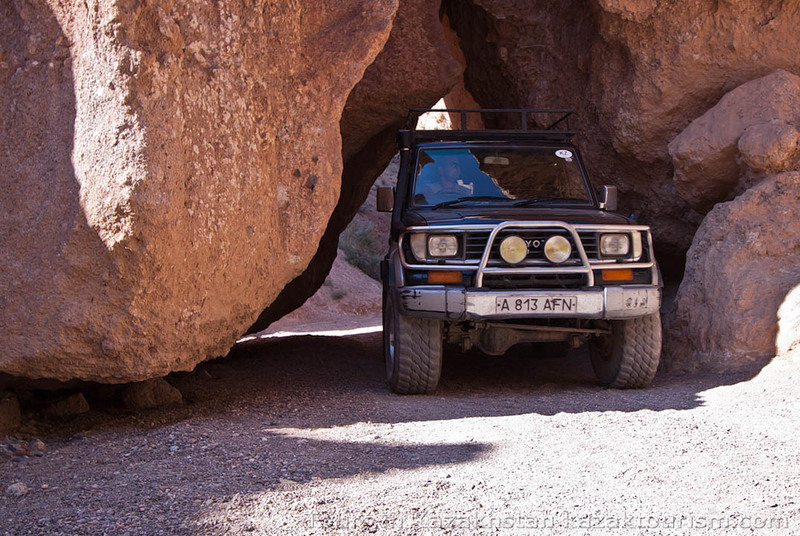 Two and three days tours or weekend tours from Almaty and longer journeys for visiting the Charyn canyon are offered. The Charyn canyon is one of the most beautiful places of the Almaty region and it is for sure one of the most spectacular natural spots worth seeing in Kazakhstan. We wish you a nice journey and many unforgettable impressions!The article has been prepared using the information from the open sources.